Eventually a new coach at UCLA discovered the legacy of this team and raised money to invite the championship winners back. This new coach honored these former players with rings and a game day ceremony. Gin said, “And I thought that was so cool. That’s like the ending of a movie.” And so began her inspiration. Of the many books Gin has read about sports, not a single one featured a female protagonist. “I think it’s about time,” she said. “My hope is that we start a new genre of books.” Gin’s pioneering novel has received significant attention from coaches, Olympic athletes and fans around the world. Julie Foudy, 1999 USA soccer champion, Olympic gold medalist and ESPN broadcaster, endorsed the book right away. Foudy said, “We need stories like When Girls Became Lions for the next generation of girls in sports.” It has been hailed by many as an innovative inspiration that paves the way for women’s sports. The official book launch for When Girls Became Lions took place on Sunday, November 22, from 5 to 7 p.m. at the CinemaSalem Café in Salem, Massachusetts. When she’s not writing, Gin may be jetting around the world for one of her many speaking engagements on sport ethics or social psychology of sport. 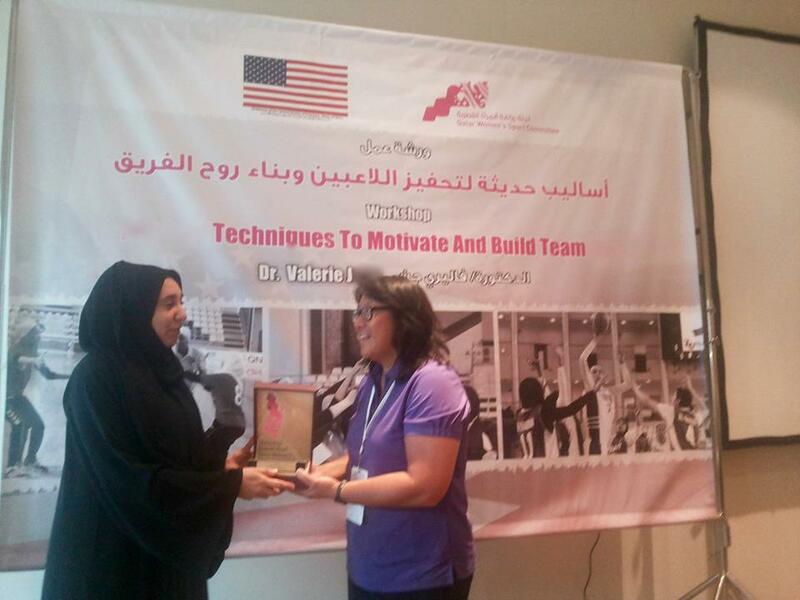 She recently travelled to Doha, Qatar, where she was invited to host a two-day coaches’ workshop for the Qatar Women’s Sports Committee in partnership with the Qatar Women’s Sports Foundation and the U.S. Embassy. The following week, she and a collaborator would be at Baylor University to present a paper on The Declaration on Sport and the Christian Life. After that she was off to Orlando to facilitate an event for an international sport coalition. If you ever visit Gin on her third floor office in the middle of a long hallway, she’ll probably be advising a student or preparing for class, but she’ll likely welcome you for a casual conversation on her couch. My suggestion: Go before the paparazzi find the Ken Olsen Science Center.